Today, water flows downhill. The University of Houston’s College of Engineering presents this series about the machines that make our civilization run, and the people whose ingenuity created them. They loom over us. Some shaped like golf balls on their tees, others like the buckets that they are. They’re water towers. And they’re engineering at its best. 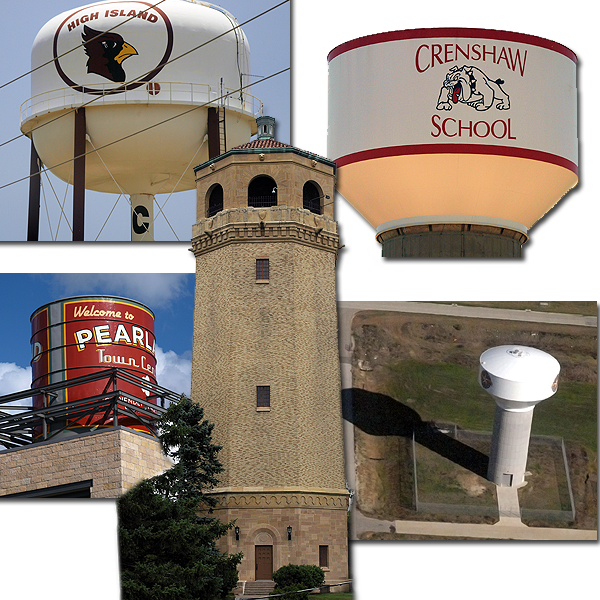 In times past, water towers were filled by collecting rainwater. Today, we typically treat groundwater then pump it into a sealed tank. We might ask, if we’re going to spend all that energy pumping water up in the air, why not just pump it directly to homes and businesses? The fact is, we could, and some water systems are set up that way. 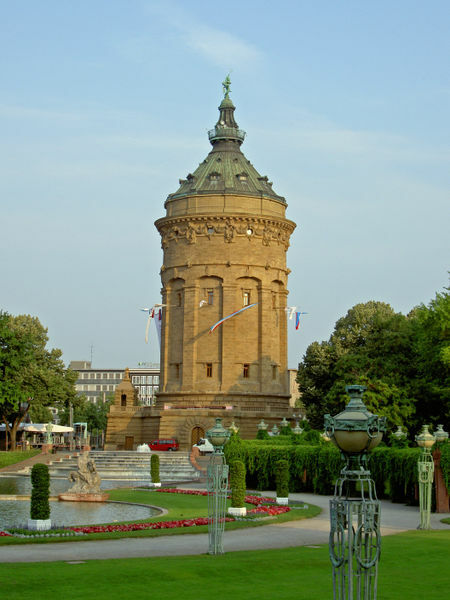 But water towers offer some important advantages. We can still get water even if the power goes out. Once the water’s in the tower, gravity will do the rest. It keeps running even if televisions and air conditioners won’t — at least until the tank runs dry. But there are some less obvious advantages as well. We use a lot of water during the day, but very little late at night. If we relied on water pumps alone, we’d have to buy pumps large enough to handle peak demand. If not, our morning showers might be more of a drizzle than a rousing spray. With water towers, we can use smaller pumps; pumps capable of handling only average demand. 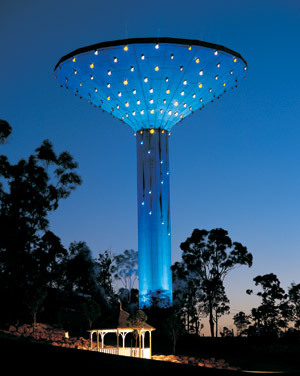 A well designed water tower system will tend to empty during the day, when the pumps can’t keep up, then fill at night. Overall, this leads to greater efficiency. Electricity isn’t the same. We can store it in batteries, but we lose a lot of energy in the process. We don’t get that kind of energy loss by pumping water up rather than out to homes and businesses. The energy used to pump the water up becomes the potential energy of the suspended water. We recover almost all of that energy when gravity pulls it back to earth. 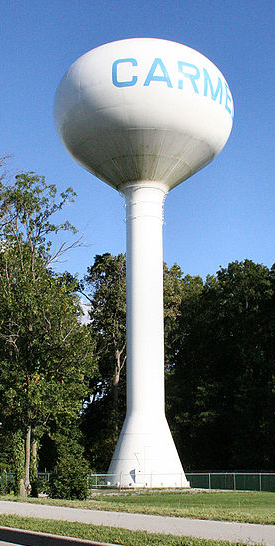 Of course, the water tower needs to stand taller than the buildings it serves. Imagine building a water tower tall enough to serve the skyscrapers in Manhattan. But that’s actually what happens. Each tall building has its own water tower — on top of the building. It adds a level of safety, too, since water to fight fires will flow even if the electricity goes out. And there’s one more benefit to water towers, though not everyone views it as a benefit. Community water towers stand proudly against the sky. They can be used to express civic pride or a little humor — with towers shaped like an ear of corn, a bottle of ketchup, or a pineapple. Some are quite beautiful, designed like clock towers or abstract geometric forms, and brightly decorated during the holidays. But most water towers remain plain in design and decoration. Perhaps someday artists will take as much interest in them as civil engineers have. 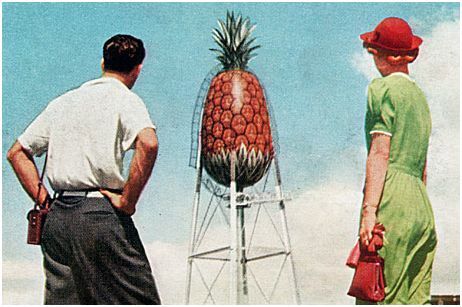 The picture of the pineapple water tower is taken from the Dole Tiny Pineapple Gallery web site: http://www.tinypineapple.com/gallery. All other pictures are from Wikimedia Commons. The collage of photos were taken by John H. Leinhard.